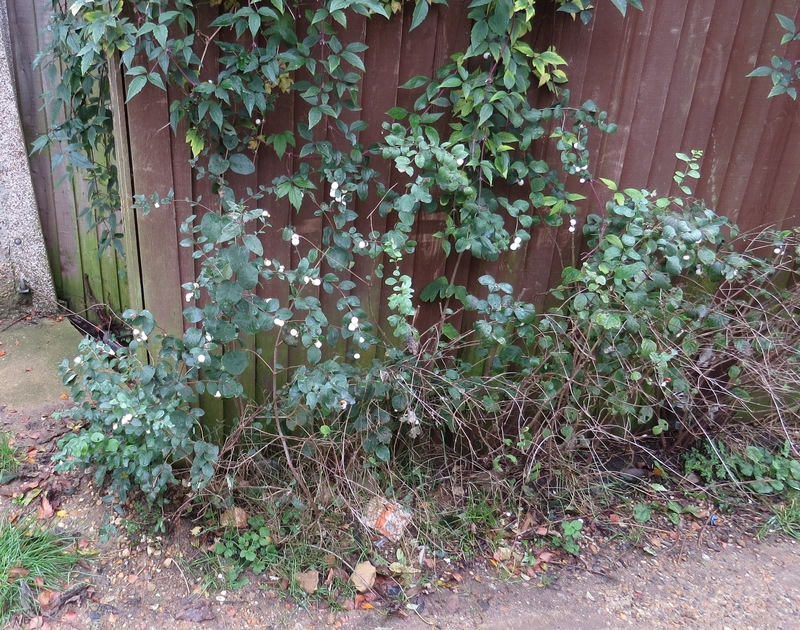 I have spotted this shrub in several places in East Finchley – in Cherry Tree Wood, in the cemetery and here, in a lane that I discovered a few months ago. At this time of year, its berries glow with such an intense white that they almost seem to be phosphorescent. This North American shrub was introduced into the UK in 1817, and it has an interesting history. It was often planted on grand estates to provide cover and food for grouse, pheasant and partridge and is described by Oliver Rackham as a ‘gamekeeper’s plant’. Other birds, such as blackbirds, will eat the berries if nothing else is available. 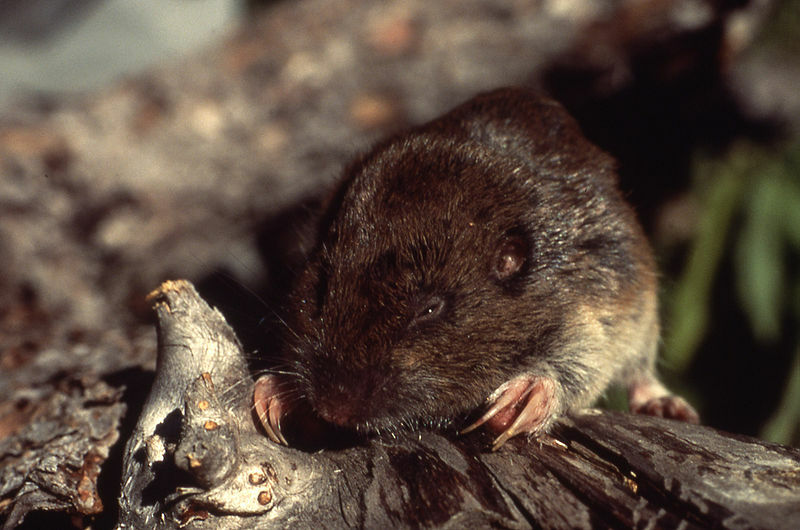 In its native North America, however, the fruit is eaten by bears, bighorn sheep and white-tailed deer, and pocket gophers dig their burrows underneath it. 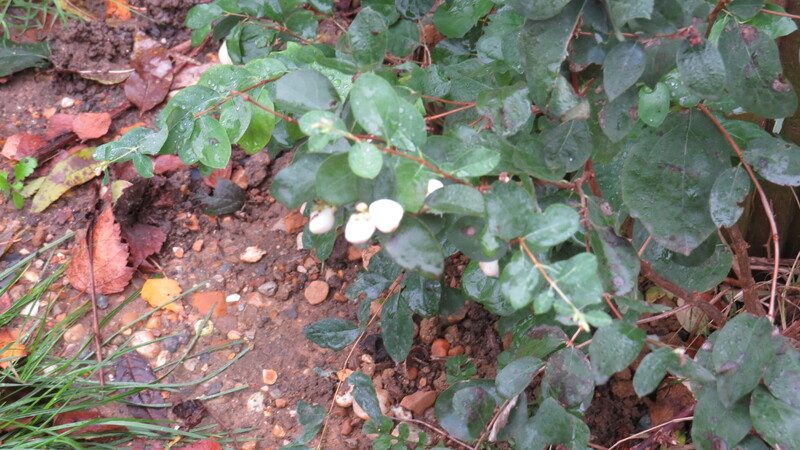 Snowberries are toxic, but their extreme whiteness (which has led to the alternative name ‘corpseberry’) seems to put people off from tasting them. Indeed, in some Native American traditions, the berries are the preferred food of the dead. However, it has also been widely used by many peoples of North America, as a medicine for humans and horses. The wood of the Snowberry was believed by the Nez Perce tribe to protect infants from ghosts if woven into their cradles. 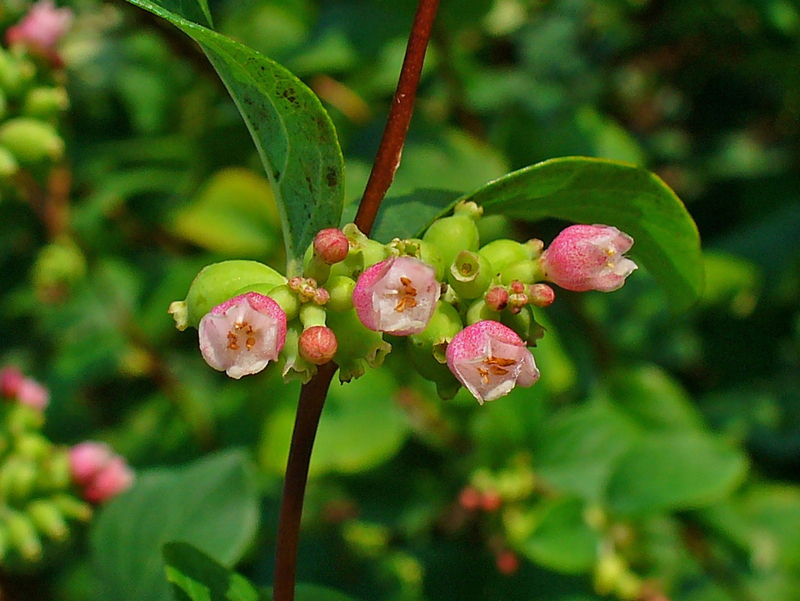 Thompson Indian babies were washed with a soap made from Snowberry, and people of the Makah tribe believed that it would deflect witchcraft if the leaves were chewed and swallowed. There is a rich folklore attached to this plant in its native land, demonstrating yet again that even plants which we disdain as poisonous may be used if (and only if) the people working with them have a deep understanding of their chemical properties. The plant reproduces via its berries (the seeds being spread by birds and other animals), and also via suckering, so it spreads easily, and I’m sure that the plant in these photos had crept under the fence from the neighbouring gardens. The berries have a very hard coating, which means they can lay dormant for up to ten years, just waiting for the time to be right to germinate. Apparently, they make a satisfyingly loud crack when stamped upon, and the seeds inside look like snow. I might experiment with this if I can find a quiet corner and an unloved single snowberry to test. In Shropshire, the plant is known by the delightful name ‘Lardy Balls’. Lard was sold in the market incased in pigs bladders, which looked like big white balls. This is rather less romantic than ‘ghostberry’ or ‘waxberry’, which are other alternative names for the plant. In spring, the bush has attractive but unobtrusive pink flowers, which are popular with bees – this plant is, after all, a member of that pollinator-magnet, the honeysuckle family. 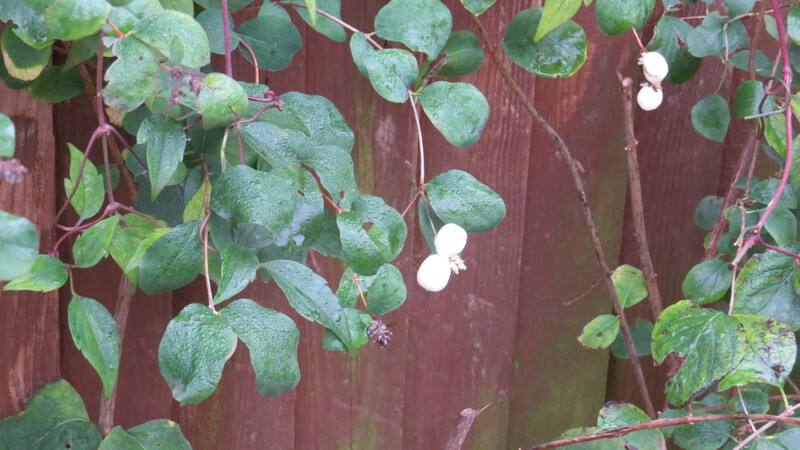 Snowberry is unique in the UK in having waxy-white berries – the only plant that I can think of that even comes close is the Mistletoe. It has an eerie quality, especially when seen as the sun is going down on a winter’s evening. I am trying to pay a little more attention to how plants make me feel when I spend time with them, and with Snowberry I sense a kind of quiet patience, as if the plant is just waiting to be recognised for its sterling qualities. Or maybe that’s something that we all secretly long for. Whichever it is, I have grown very fond of this North American immigrant, thriving so far from home. This entry was posted in London Plants on December 3, 2014 by Bug Woman. I have often seen this plant on my walks though ever knew anything about it so I thank you for the lesson. I do think that the name ‘Lardy Balls’ shall indeed be added to my vocabulary.